A CIA insider has gone public with sensitive intelligence community evidence that reveals China's military forces are helping to secretly smuggle gold into their central bank. "[My source] brought gold into China at the head of an armored column of the People's Liberation Army. I guarantee that [gold shipment] did not show up in the official Hong Kong import figure." Rickards declined to name his source, only admitting he was a high-level officer of a major private secure logistics firms. Rickards contends that because of this suspicious activity, the Chinese government now owns 4x more gold than they admit. "They lie about this," he said. "They officially say they have 1,054 tons; that's what the official records show. But in reality they have more than 4,000 tons." This secret stockpile would amount to more than 10% of all government-owned gold in the world, all by itself. Rickards' claims mirror those being made by both Forbes and the Financial Times. They have reported on a massive discrepancy in China's official gold consumption data for 2013: a 500-ton "gap" between production/imports and demand. These publications pointed to this as evidence that the People's Bank of China is buying gold secretly… and then lying about it. Rickards explained the reason China has been going to such great lengths to conceal this operation. "Gold is relatively cheap right now. China would like to keep it this way until they reach the finish line." "The minute they pull back the curtain, you are looking at gold shooting well past $2,000 an ounce. The ceiling could be astronomical. Of course this will rock the global stock markets and crush the U.S. dollar. So they have to time their moves just right." 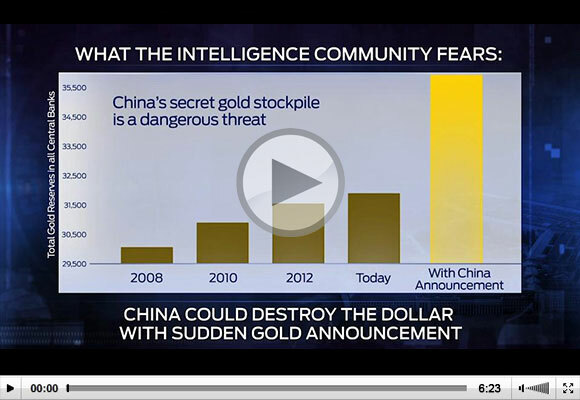 Rickards predicts China will wait until early 2015 to leak their true gold reserves. And when they do, it will likely be a surprise announcement. China has done this before, most recently in 2009, when the People's Bank revealed overnight that its gold reserves had almost doubled. But few people are prepared for the impact of the next announcement. During the interview Rickards revealed a series of charts known to the intelligence community. The one below shows the future impact of China's true gold position on the reserves of the world's central banks. In addition to being the CIA's Financial Threat and Asymmetric Warfare Advisor, Rickards helped lead a sensitive operation called Project Prophecy. Three days later, in London, a plot involving a cell of 24 Pakistani extremists was thwarted. Their targets were 10 U.S. passenger jets that were going to be blown up simultaneously using liquid explosives. Rickards believes that China's plot to smuggle gold is alarming, but it is just one of five dangerous "flashpoints" that could soon ignite a $100 trillion economic collapse. He believes this outcome is unavoidable. And many of his colleagues agree. A sensitive report has surfaced containing the consensus view of all 16 branches of the U.S. Intelligence Committee which suggests emergency preparations are already being put in play for this crisis. These agencies, which include Rickards' CIA, as well as the FBI, NSA, Army, and Navy, have already begun to jointly estimate the impact of, as the report stated, "The fall of the dollar as the global reserve currency." The nightmarish endgame scenario presented in this report involved "a worldwide economic breakdown and an extended period of global anarchy." 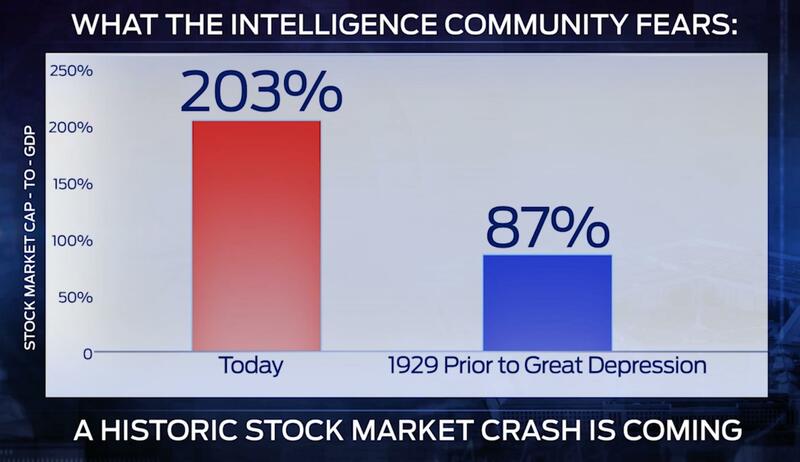 "When one of these flashpoints strike, the first phase will appear as a nearly instantaneous 70% stock market crash. From the outside, nobody will see it coming," Rickards explained." "Once it becomes clear that it's not a flash crash – it's a systemic meltdown in the economy itself, that's when the gravity of the situation will sink in. And there will be no digging out from it." Shocking: Details of U.S. Government's "Day After Plan" for this collapse emerge. (Alarming footage surfaces). Rickards warned Americans to avoid rushing into what he referred to as "paper gold investments," like the GLD ETF, in advance of this looming crisis. He described it as an upside-down pyramid scheme. "Imagine you have a pyramid, only it's inverted," Rickards explained. "At the bottom you have this tiny block of physical gold and then on top of it you have these expanding layers of paper gold. Gold leasing, unallocated gold forwards, gold futures, gold options, and gold ETFs." "The amount of physical gold stays the same, but the pyramid keeps getting larger. However, China is actually taking this physical gold off the market and putting it in their safes where it won't see the light of day for hundreds of years. All that means is the pyramid is eventually going to collapse." Rickards is making his message loud and clear. Americans need to take action now to prepare for that unfortunate day. To help them, during the interview he provided a specific set of investment recommendations to target immediately.